1 box firm silken tofu (I use Mori-Nu). 1. Press tofu for 20 minutes. (see below for more info). 2. Once tofu is pressed put all ingredients for tofu whipped cream in a food processor and blend until smooth. 1. Combine chopped fruit and tofu whipped cream and gently stir to mix all together. 2. Fill a large pie plate about 2/3rds full with water. 4. Dip rice paper into pie plate so paper is completely submerged for 2-3 seconds. 5. Lay rice paper on hand towel and let rest for 20-25 seconds. 6. Spoon out some of the fruit and tofu mixture and place it on the rice paper (see #1 below in red). The amount should be about the amount that would be in an eggroll. 7. 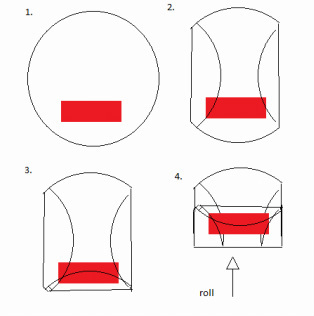 Fold both sides of the rice paper (see #2 below). 8. 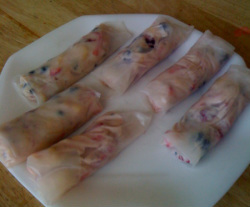 Fold end over fruit and tofu mixture away from you and then roll it to the end (see #3 and #4 below). 9. You are done!! You can eat them this way or for a crunchy treat. Heat the oven to 350 degrees, lightly spray cookie sheet with Pam or they will stick BAD and then cook on each side for 15 minutes. Pressing removes most of the moisture. Open the tofu and put a double layer paper towel on a plate. Set the tofu on top of the paper towel and then put another double layer of paper towel and set a heavy book on it. Let sit for about 10 min. Replace both sets of paper towels, flip the tofu and repeat.